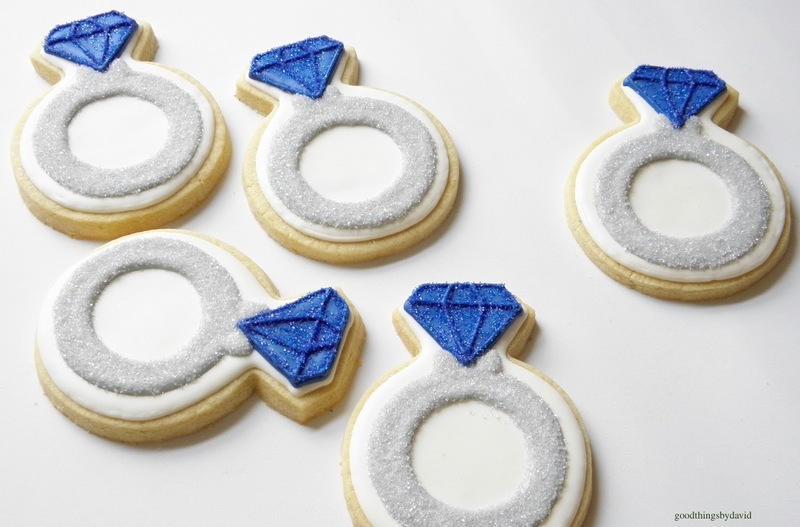 The idea of handing out beautifully iced ring cookies as favors for a special celebration, is brilliant. Every admirer of precious stones can find numerous occasions on which to gift these to close friends and family, be it for a wedding, a wedding shower, an engagement, or even a special milestone birthday. 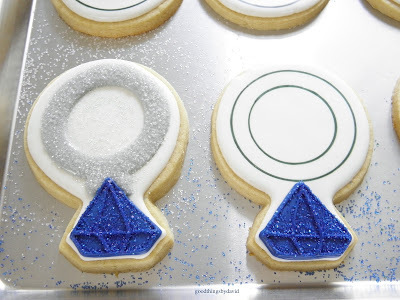 What I love about creating this type of cookie design is that you can tint the icing of the precious stone to match someone's birthstone, or perhaps the recipient's favorite gem color. If you want to make your cookies sparkle like these rubies, amethysts, emeralds and sapphires, I highly suggest using fine sanding sugars that match the color of the royal icing. Not only do you want this for the stone itself, but for the ring band as well. The platinum rings were dusted with a good amount of silver sanding sugar. However, if you want to make gold bands for the rings, use a sparkly gold sanding sugar. Nothing is more important than starting out with a good sugar cookie dough. You want it to be flavorful, sturdy to work with and able to stay fresh for several days. If you aren't familiar with my recipe already, I highly suggest that you use it for your next decorating project. Not only is it easy to work with, but it tastes extraordinary, and can be flavored to your liking. Making a double batch of it is easy with my large 7qt. 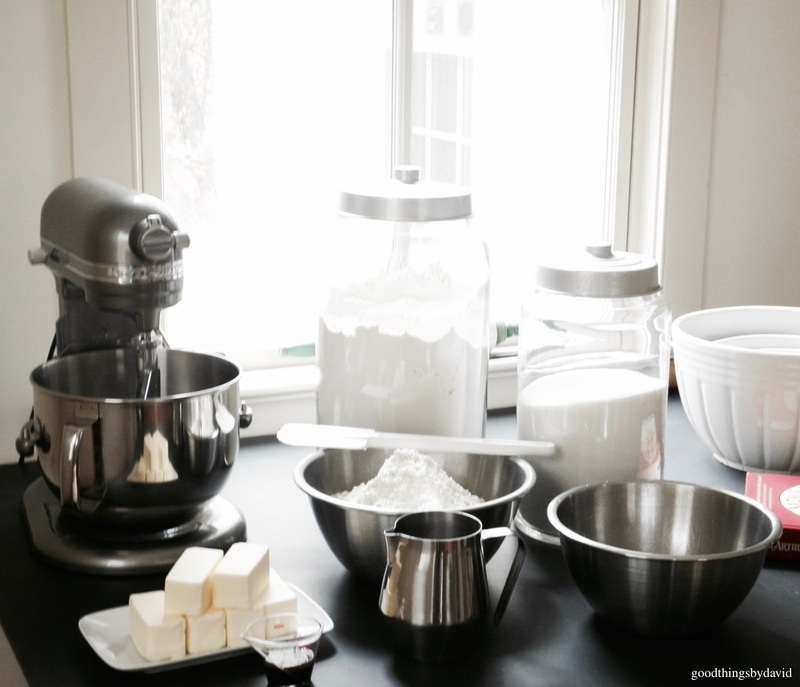 KitchenAid mixer. 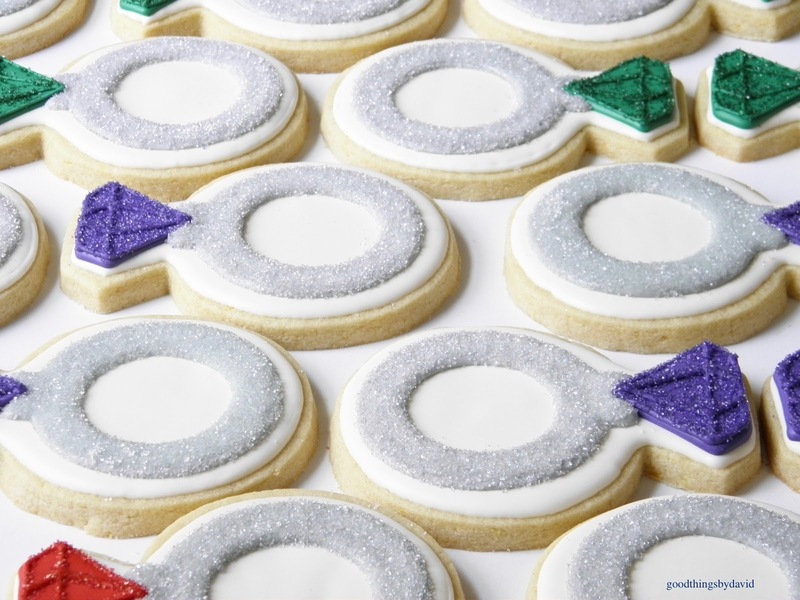 Use a wedding ring cookie cutter to cut out shapes (these can be found at many baking supply stores and online), and make sure that they are baked and cooled completely before icing. I always roll out my cookies to a good 1/4" thickness, because it gives the cookies a professional look, and it makes them very sturdy to work with. 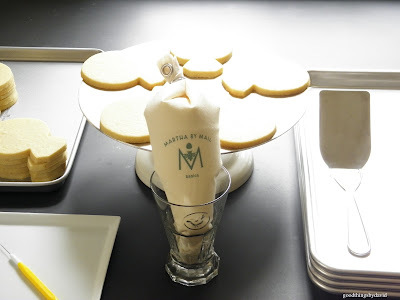 Fill a pastry bag with white royal icing, that is of flooding consistency, and flood the entire base with it. Let the icing dry completely before continuing. If white icing is not dry and you begin to add other icings, it runs the risk of bleeding and making a mess of your work. Once the bases are dry, begin the ring designs. I used two round cookie cutters and a food-coloring marker, to outline the ring. Make sure that the ring is centered in order for it to work with the gem. Anything off center is going to give you a crooked ring. Outline and flood the gem in the color of choice, using a #2 or #3 piping tip, making sure that the point of the gem meets the top of the ring as shown above. Let it dry completely. 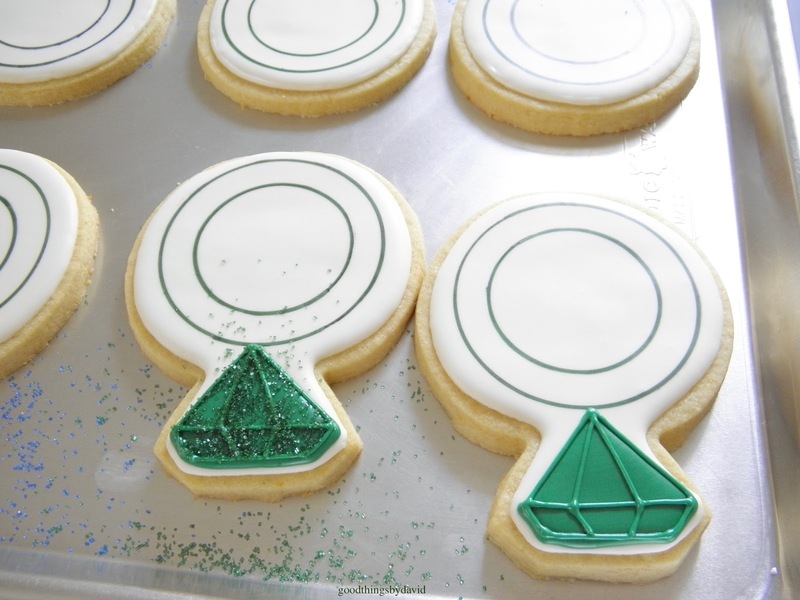 Using a fine #1 piping tip and the same color of icing, trace the cuts of the gem as shown (top, right). Immediately flock (dust) the gem with a matching sanding sugar. Let dry completely and remove any stray crystals with a fine brush. 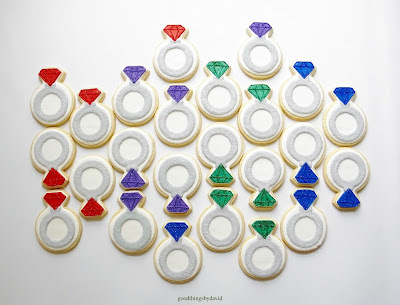 For the platinum ring, outline and flood the ring area in a very light-gray royal icing, adding a set of prongs on each side of the gem. Immediately flock the wet icing in silver sanding sugar and let dry completely. Remove any stray sugar crystals with a fine brush. Can you see how even each of these cookies are? 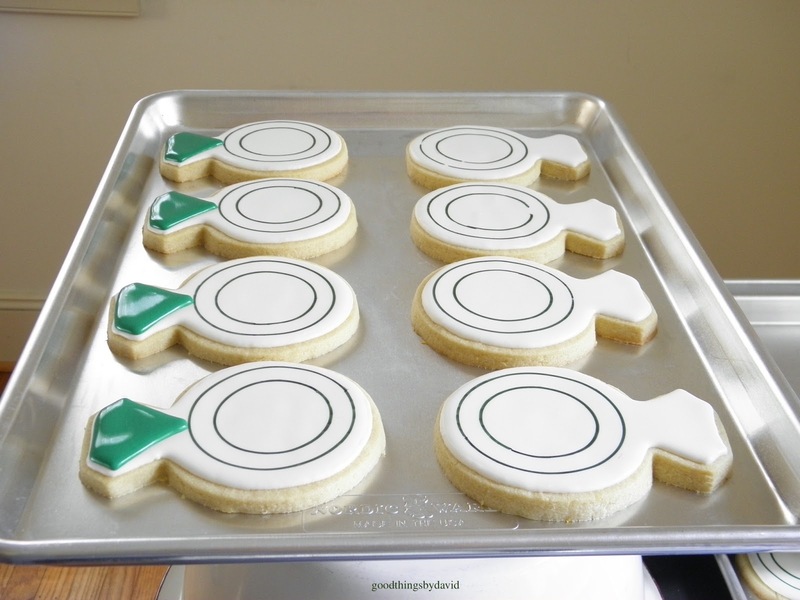 I love using 1/4" dowels when I roll out my cookie dough, so that every single cut out is exactly the same as the next. When the cookies have dried completely, you can then transfer them to clear-topped boxes filled with crinkle paper or slip them into cellophane bags for gift giving. 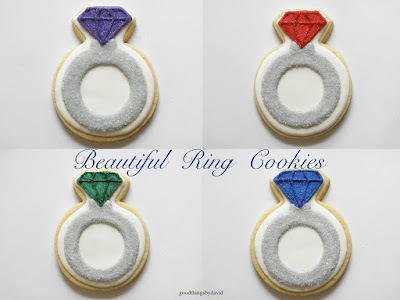 How easy was it to create beautiful ring cookies? 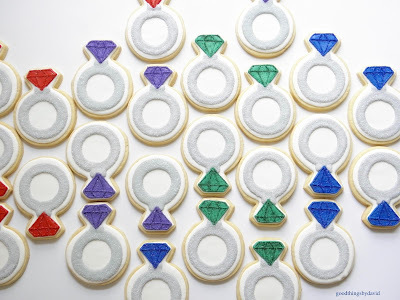 Dozens of these can be made for many types of celebrations, and I can almost guarantee that everyone will want to have at least one of these precious beauties. 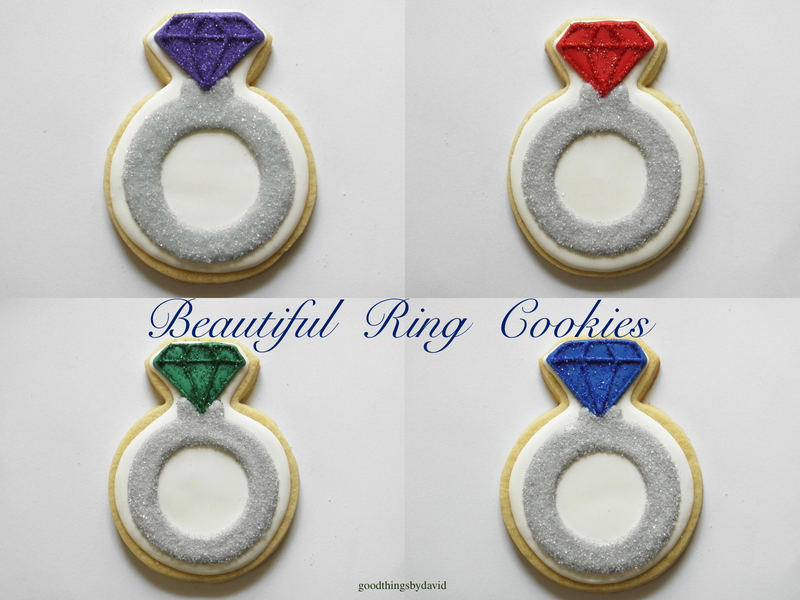 Remember these beautiful ring cookies the next time you want to add some sparkle to your special occasion.